Thanks to microbeaming speaker drivers and brilliant DSP processing, the Fidelio B1 really does sound bigger than it looks – at least when it comes to TV and movies. According to Philips there’s a growing demand for smaller soundbars, as everything from consoles to media players fight for space beneath the average TV. But can the £450 (around $570, AU$760) B1 defy the laws of physics and produce crowd-pleasing sound from something not much larger than a burrito? In short: it certainly can. Philips, under the auspices of Gibson Innovations, has done a remarkable job of compacting the average soundbar. The B1 measures just 41cm (or about 16.14 inches) meaning it wouldn’t look out of place beneath a modest 30-/40-inch screen and, speaking in the most general of terms, build quality and design are great, reflecting the upper mid-range pricing. 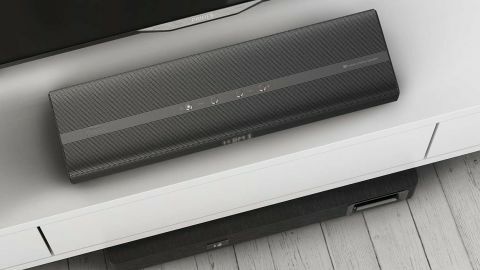 The main body of the soundbar is protected by a rolled aluminium grille, while the end panels are black fabric. A quartet of shiny on-body controls (power, input and volume) do as they’re told, while connections are recessed to the rear. Speaking of inputs, there's an HDMI-In plus an HDMI ARC output. You can also hook up via a 3.5mm minijack, USB or optical digital input. It’s worth noting that the HDMIs on the B1 do not support 4K HDCP 2.2, just in case you had hopes of routing your Sky Q set-top box through to a UHD TV. Wireless connectivity comes via Bluetooth aptX with NFC pairing. The system ships with an appropriately compact remote control (so expect to lose it behind the cushions), which covers input selection plus volume and bass/treble adjustment. Now, this compact design might make you a little skeptical when unboxing the B1, but sonic performance warrants at least one thumb up. There’s more than enough volume here to fill the average small room, and the front soundstage is surprisingly wide. The secret to this success is a brace of microbeaming speaker drivers. Four drivers (two at the sides and two centered) are arranged in a cross-firing configuration, to create a wide sweet spot. There’s a pair of additional soft dome tweeters in the top of the unit, each used with an 18-hole waveguide that effectively produces a virtual speaker array to heighten the soundstage. The partnering wireless subwoofer is a front-ported enclosure made from everyday MDF. It has reassuring weight, and comes with a helpful plastic stand which makes it easy to position vertically. With a depth of just 86mm (or 3.3 inches), you’ll also be able to slide it horizontally beneath the sofa. A frequency sweep confirms that the soundbar expends most of its energy at 200Hz and above, leaving the sub to fill in below. Consequently, the bass is quite directional, and it becomes somewhat divorced and a little bit unruly if the sub is placed too far from the soundbar. Vocal presentation benefits from a clean mid-range, and the sub moves a fair amount of air. Indeed, with action-orientated TV shows the surplus of grunty low-bass can become a bit overbearing; by dialling it back a tad the balance quickly becomes rather more agreeable. Duly balanced, Mad Max Fury Road is delivered with all the ferocity you'd rightly expect. The B1 ostensibly handles a 5.1 bitstream, but at no point were we under the illusion that we were listening to any kind of faux multichannel. Soundbar, sure, but home cinema this is not. That said, the B1 also makes for an entertaining gaming sound system – Battlefield 1 sounds suitably chaotic and visceral. Of course, the modern soundbar needs to do more than add slam to movies and games. Increasingly it's the prime loudspeaker in a living room, and how it handles music is paramount, whether that music streamed over Bluetooth or played direct from a connected source. Here, some of the limitations of the B1’s design become more apparent. With two-channel music, that sub localisation can become hard to ignore. A dedicated Music mode helps, as this smoothes out the presentation, removing the mid-range lift which serves movie dialogue so well; the result is a more enjoyable listen.